August is here and we are taking full advantage of summer’s bounty – filling our farmers’ market bags and bellies with amazing local produce. 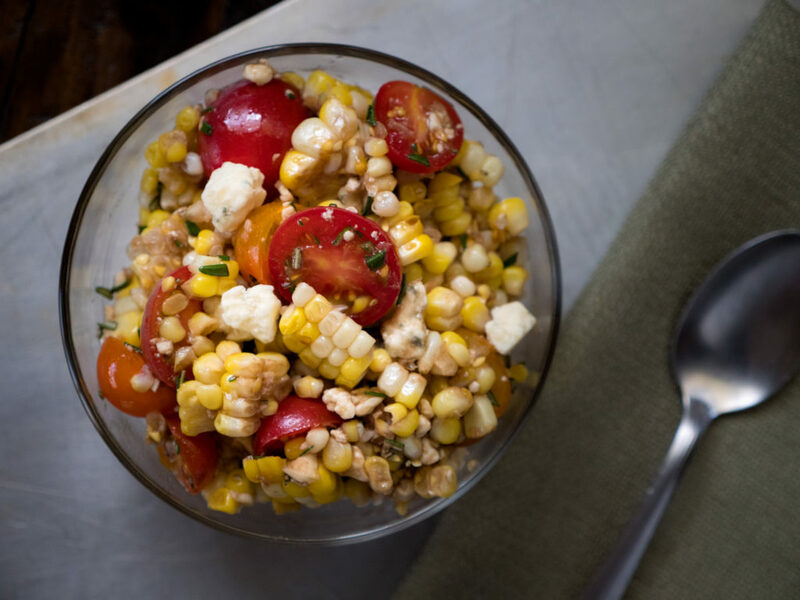 At peak flavor right now are two favorites – corn and tomatoes. While I adore sweet and crunchy local corn, I’m one of those people that hate to eat it on the cob in public. Having corn stuck in my teeth drives me crazy and I need to immediately floss. So, when it comes to having corn if there’s company around, I always choose to make a corn salad. It allows for all of the wonderful flavor without the mess. I just cook the ears, cut the kernels off the cob, and toss with any variety of fresh ingredients for a hearty side salad. You can certainly boil the corn, but for this summer salad, I go a step further and grill it. This allows the kernels to get slightly charred, drawing out their inherent sweetness and adding a subtle smoky flavor. Then, I combine those sweet kernels with bursting cherry tomatoes, garlic, tangy blue cheese and a simple balsamic vinaigrette. It stores well so you could easily make it a day ahead of time for your next summer picnic or cookout. Soak the ears of corn with husks on and silks removed in cold water for 20 minutes. While the ears soak, heat the grill to medium (350 degrees Fahrenheit). Remove the corn from the water and shake off any excess water. Place the on the grill. Cook for approximately 15 minutes. Rotate the corn every five minutes or so to keep it from getting too charred on one side. Wearing an oven mitt or using a potholder, remove the corn from the grill. Grasping the bottom end of the cob, peel off the husks like a banana. Then snap off the end. Place the peeled ears back on the grill over indirect heat. Cook for approximately another 10-15 minutes, occasionally rotating, until the kernels are lightly caramelized. When most of the kernels are lightly caramelized, remove from the grill. Let it cool for a few minutes. Then stand the ears of corn up in a large bowl. With a sharp knife, cut the kernels from the cob. To that bowl, add the halved cherry tomatoes, minced garlic, minced rosemary and blue cheese. Pour in the olive oil and balsamic vinegar. Season with salt to taste.